Last month, Twitter added a "sparkle" icon that allows iOS users to quickly swap between two different ways to view tweets. The current method of viewing messages on Twitter presents the "Top Tweets" based on the subject matters that Twitter believes each user is personally most interested in based on its algorithms. By tapping the aforementioned "sparkle" icon in the upper right of the screen, the feed switches to showing tweets in reverse chronological order. This is the original method used by Twitter to show tweets. Today, Twitter announced at an event in New York City that this feature is now available for Android users. When the "sparkle" icon is tapped, Android users will see a box appear at the bottom of the screen. The first time you press the icon, the top of the box will say "Home shows you Top Tweets first." Underneath this message will be an option to "See latest tweets instead." Tapping on this will show the latest tweets on the very top of the page in reverse chronological order (see images at the top of this article). This means that the most recent tweet will be on top. If you do switch to the latest tweets, the next time you tap the icon the message on top of the box will read "Latest tweets show up as they happen." The option underneath will allow you to "Go back Home," where you will see the "Top Tweets" first. No matter which setting you're using, the box also includes a link to your content preferences. The feature is currently rolling out via a server-side update. This means that Android users won't have to lift a finger to receive the "sparkle" icon on their Twitter app. So this means that it's back to working the way it should! Your move Instagram! 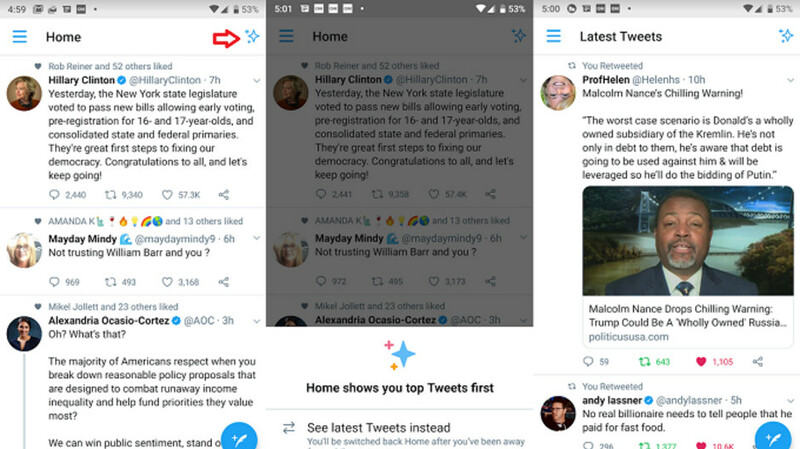 "Twitter for Android now allows users to see apps in reverse chronological order" Is there a mistake in the title?